After Bennett asks where US was in Holocaust during Auschwitz visit, Langfan cites Yad Vashem historical analysis to answer. 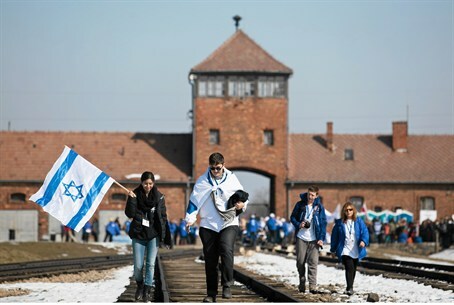 During a landmark visit of MKs to the Nazi death camp of Auschwitz on Monday, Economics Minister Naftali Bennett asked "where was the US during the Holocaust?" Mark Langfan, Chairman of Americans For a Safe Israel (AFSI), took the opportunity to cite Yad Vashem Holocaust Memorial's answers to the question. "Israeli Jews must look to see how Americans failed European Jews during the 1930s and 1940s in order to see if Israelis can rely on Americans today," stated Langfan. "In the first Holocaust, based on Yad Vashem's historical analysis, the answer is simple: America and American Jews did nothing." Langfan's response came after Bennett and Deputy Defense Minister Danny Danon spoke to Arutz Sheva during the visit to Poland about the American failure to bomb the camps and halt the genocide during the Holocaust. "It always bothers me that the US could have bombed (the camps), could have made it their mission to stop the killing machine," Bennett commented. "But out of tens of thousands of missions during the war, they did not make an attempt even once. We will never rely on anyone else but ourselves." Dannon remarked "the US failed to bombed Auschwitz, and when they could have done it they said 'it's not part of the war effort.'" He noted that the horrific realities of the genocide that took place at the camp forces one to ask what the war was for, if not to stop the massacres. Yad Vashem's internet resources attempt to answer the question of why Allied Forces didn't bomb Auschwitz. "The first detailed information about Auschwitz reached the Allies in June 1944...the information included a request to bomb the camp and the rail lines leading to it. The Allies had command of the skies by that time, and air bases in Italy brought the Allied forces in the West within range of parts of Poland," notes Yad Vashem. "From the spring to the autumn of 1944, Allied aircraft flew over the camp several times on a mission to photograph German industrial plants a few kilometers away. In the late summer these plants were bombed, but the extermination camp Auschwitz-Birkenau was never bombed," the resource adds. Yad Vashem discusses the American reasons given for not bombing the camp, which centered around claims that only victory in the war would save the Jews, and that such bombing missions would "divert forces." In the final analysis, the museum notes "it is clear that the Allies did not marshal the same energy and determination to rescue the Jews as the Nazis did to murder them." The resource also attempts to answer the question of what American Jews did to halt the genocide, noting that most Jews were new to the country and lacking unity and a central representative organization. Additionally they were dealing with a raising tide of American anti-Semitism, as many prominent Americans including Henry Ford and Charles Lindbergh were outspoken Jew-haters. "The American Jewish Committee, which represented the wealthier, more Americanized German Jews, believed that the best way to deal with Hitler was diplomatically and quietly, with behind-the-scenes negotiations," notes the resource, adding that Jews working in the government "were often more American than Jewish, and did not want...to risk their jobs on a purely Jewish issue."